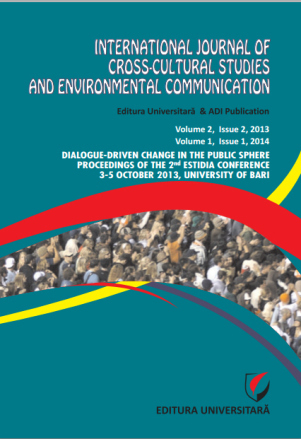 The International Journal of Cross-cultural Studies and Environmental Communication has decided to devote two special issues (Volume 2, Issue 2, 2013 and Volume 1, Issue 1, 2014) to selected papers presented at the 2nd ESTIDIA Conference, University of Bari “Aldo Moro”, Italy on 3-5 October 2013. These papers raise and discuss a significant range of current issues related to the theme of the conference “Dialogue-driven Change in the Public Sphere”. The first of the two special issues (Volume 2, Issue 2, 2013) brings together 17 articles devoted to the following three topics: (1) Multi-voiced discourses in the changing European public sphere; (2) Changing strategies in gendering discourses; (3) The impact of digital environments on citizens’ empowerment.